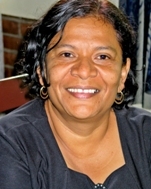 Emilia has been an SOS mother for over 27 years at SOS Children Village Estelí. Looking back, she shares with us some of her memories and experiences. I'm very proud of many of my children. For example, I feel very proud of one of the oldest girls from the village; she came to Estelí before I arrived, around 1972. She was in my care only briefly, while she was finishing her studies. After that, she went to Honduras to study nursing, and later to Mexico to study painting. Now she enjoys her job of taking care of sick people at the hospital; she is a very good person. To her, I am not only a mother, but also a friend. Several years ago, when I was already an SOS mother, I learned for the first time what motherhood really means. I received an eleven-month-old baby girl, and because she arrived in a very dire state of health, I had to take extra care of her. I spent several sleepless nights by her side, watching every move. Before that, I was content with living at the village, but when that little girl came, I really felt like a mother. It is an impression with an impact so different to any other feeling that I don't even know how to explain it. I believe that it is when an SOS mother takes a baby into her family that she can truly experience what tenderness and motherhood feels like. Now, with every single child in my care, when they are sick, I don't complain because of the nights I have to spend by their beds; instead of that, I think of the pain and suffering they are feeling. I have a very good relationship with Rosibel, one of the girls I have been raising for a few years. She was only nine years old when she came to the village with her five little siblings. Rosibel was like an "old young girl" because she was the eldest among her siblings and was always taking care of them. She used to tell me about her sad experiences before coming to the village. When your children tell you their histories, it arouses all kinds of feelings in you... I try not dig into their pasts so that they do not have to constantly deal with emotional injuries, but when they come to you, like Rosibel, I like to listen to them. Although SOS Children's Villages is a non-political organization, the Sandinist Revolution in the late 1970s still had a strong impact on the village. It was a very distressing time for us; we went through a lot of difficulties to secure our supplies, since everything was rationed. Sometimes we didn't have medicines or milk; we had to look for those things in towns close to the village. The revolutionaries used to give us cards to buy bad quality groceries, and all the SOS mothers had to wake up at 1 am to queue up for getting gas for cooking. Fortunately, we had an external contact, Miss Luisa, who sent us medicines and groceries from Guatemala. That contact was also working with SOS Children's Villages, and she put in a lot of effort on behalf of the children. Another difficult time during the revolution was the currency change. It complicated the village's budget, and a lot of people lost all their savings. Here at the village, we had to cut expenses and save even more. One good thing about the revolution was the literacy crusades; they were sending students to teach peasants how to read and write. Even some of the village youth went into the mountains and nearby towns to work for these crusades. Two years ago, I had an experience that hurt me a lot with Ana*, an 18-year-old girl. She fell in love with some guy and eloped with him. For me, as a mother, it was very painful, since the boy wasn't even working, and I felt that she was going to waste her life. We even went to talk to the village director, and I advised her not to start having children so soon. However, after she left with him she got pregnant, and currently has two children. We still keep in touch... There are situations where you can't do anything, like when they fall in love. *For privacy reasons, we have changed the name of the girl.